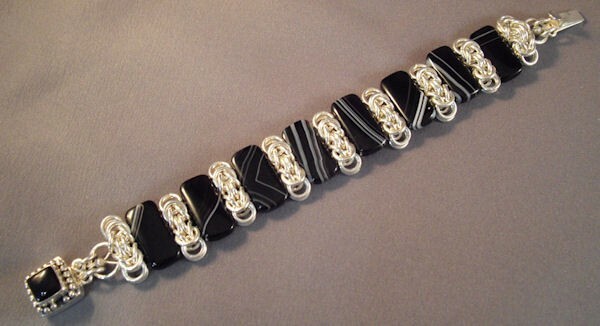 The Jeweled Byzantine Bracelet is a bracelet that combines beading and chain mail techniques. This bracelet has an infinite number of variations. You may utilize crystals as shown, or substitute pearls, double drilled flat stones or beads. It can be made in a smaller or larger version, your choice. I have made the bracelet with alternating sections of white Swarovski pearls and black Swarovski pearls for a black and white look. This is a beginner weave. The clasp is not included in the kit.